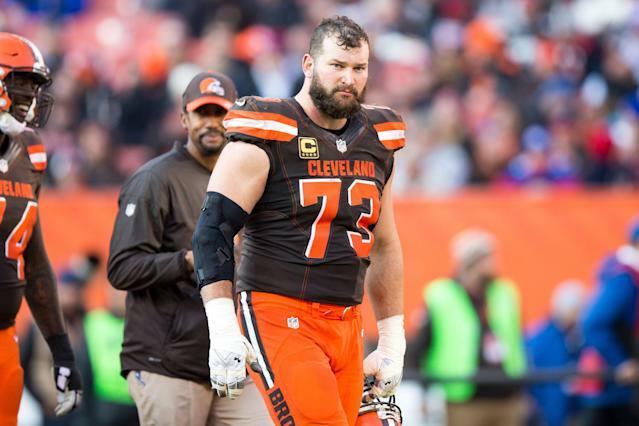 It’s probably safe to say that Joe Thomas was carrying a little more weight than he needed to while serving as the Cleveland Browns’ left tackle. Three days removed from the first anniversary of his retirement, Thomas’ podcast co-host Andrew Hawkins shared a photo showing that the 34-year-old now looks skinnier than the average tight end. You can insert your own Cleveland Browns before and after jokes here. That makes sense. You need to be around 300 pounds to survive as an NFL offensive lineman, but maintaining that weight while still staying in shape has to be exhausting and probably harmful to your health in the long run. However, cutting such a large amount of weight in such a short time span must also be exhausting, even it’s a more healthy way to live. Thomas revealed on Twitter that an embrace of swimming, yoga and a ketogenic diet, as well as a banishment of breakfast, were the keys to his weight loss. Of course, Thomas’ transformation had at least one detractor in Browns defensive end Myles Garrett. Fair enough, but we’ll see what Garrett looks like once he hangs up his cleats.